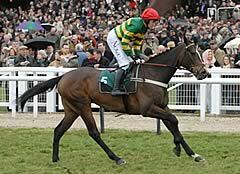 The eight-year-old, the mount of Paul Carberry, was owner J P McManus’s third winner on the day. For good measure Henderson also trained the second, Tanks For That, and fourth Anquetta. He paid tribute to his staff at Seven Barrows in Lambourn, and said his owners had been a big factor in the success he has enjoyed. At the top of the hill Bellvano was some way off the pace with plenty of horses ahead of him, but Henderson said: “That’s exactly where he was meant to be. Paul’s given him a brilliant ride. “The whole team has been marvellous, and saddling six up in the final race is a feat in itself. There are a lot of people working away here and at home and it’s been a fabulous time for all. The staff work hard and they deserve these winners. “Of course I was disappointed not to win the Gold Cup with Long Run, but he’s run a great race and Sam’s given him a wonderful ride so we have no excuses. We’ll be back. “We have known a few blank years at the Festival and I never liked them, but a lot of work has paid off. The last four or five years have been amazing. We’ve got a lot of good horses, wonderful owners and some great staff. We work for 365 days of the year, but it comes down to four days in March and you’ve got to make the most of it. Henderson’s brilliant seven days was crowned with the Thomas Pink Leading Trainer Award. His Festival total of 46 winners is a new record. Paul Carberry produced a marvellous ride to get the talented but quirky Bellvano up to win the Johnny Henderson Grand Annual Chase. Carberry has been hitting the crossbar this week with a string of thirds and fourths, but he was delighted to get off the mark in the final race of The Festival. Carberry said: “Nicky (Henderson) has had a great week and another good day today. It’s special to ride a winner for Nicky in his father’s race and for JP McManus as well. They are great men to be riding for. It is a great way to round off The Festival. That victory was Paul Carberry’s 12th winner at The Festival and his first since he steered Go Native to victory in the 2009 William Hill Supreme Novices’ Hurdle. Not only did trainer Nicky Henderson have the winner of the race named in his father’s honour, but he also had the second and fourth home, which rounds off a brilliant week for the Lambourn handler who finished up with seven winners - the most ever by an individual trainer at The Festival. Alan King was phlegmatic after Kumbeshwar gave him his fifth third place of this year’s Cheltenham Festival in the closing Johnny Henderson Grand Annual Chase. The trainer was something of an interloper in the winner’s circle, among the 1-2-4 [Bellvano, Tanks For That and Anquetta] trained by Nicky Henderson. “At least we stopped Mr Henderson’s clean sweep,” said King with a rueful smile. Reflecting on his week of near misses - before Kumbeshwar, he picked up thirds with Grumeti, Vendor, Smad Place and Medermit, and fourths with Montbazon and Lovcen - he said: “A couple of years ago it would have blown my brains. But there was a time when I was parked over there [pointing to the unsaddling area for unplaced runners] and although we seem to parked in rather the same frustrating place this week, I’ll take it.